Travel to and from school has become the focus of a government initiative aimed at cutting traffic congestion, reducing pollution and encouraging pupils to take regular exercise by walking or cycling. 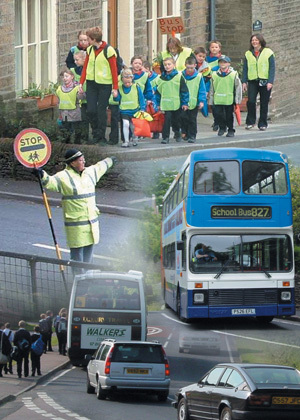 Every school is required to produce its own Travel Plan, and, to speed up this process for the 420 schools in Derbyshire, the County Council's Road Safety Team is now using an AutoData forms processing system from Kendata Peripherals. Each school's travel plan is based on the results of a travel survey, which provides detailed information about how pupils get to school and back home again. In Derbyshire, the processing and analysis of the travel survey questionnaires is carried out centrally by the Road Safety Team. "We used to enter all the data manually," said Kevin Senior, School Travel Plan Co-ordinator for Derbyshire County Council, "but as the work built up, we found that it was taking too long to get the results back to the schools. So we decided that some sort of automated data entry would be preferable." At that time, the Council's Integrated Transport Group Data Team was already successfully using an AutoData forms processing system for a variety of traffic monitoring and car park surveys, and soon the Road Safety Team was put in touch with the system's supplier - Kendata Peripherals. A high-speed A3 scanner was duly installed in the Road Safety Team's office, together with the latest AutoData Scannable Office forms-processing software. In addition, Kendata took the team's existing questionnaire and redesigned it for use in the scanner-based system. The resultant four-page A4 form features a standard centre spread, with the front and back pages custom overprinted for each school. As well as tick boxes, the form includes handprint recognition fields, free text entry boxes and each school's DfES identification number as a barcode. According to Kevin Senior, the printing arrangement with Kendata works very smoothly: "We just send them the name of the school and the quantity of forms required, and within two weeks they arrive." The forms are then distributed to schools, filled in and returned to the Road Safety Team for scanning. Information from the forms is automatically entered into a database, analysed and the results presented in a way that can be readily understood by schools' travel-plan working groups, which usually consist of representatives from governors, staff, parents and pupils. "About 130 Derbyshire schools already have travel plans or are going through the process at the moment," added Kevin Senior. "With the AutoData system, we can now provide the quickest possible turnaround for schools' travel surveys, so we are confident that we'll meet the government's target of having all travel plans in place by 2010."